Florida voters hoping to skip long lines on Election Day found themselves waiting for hours at some polling places Monday as early voting opened statewide. Some counties reported minor problems at polling stations. In Duval County to the north, four scanner machines malfunctioned but were later replaced. 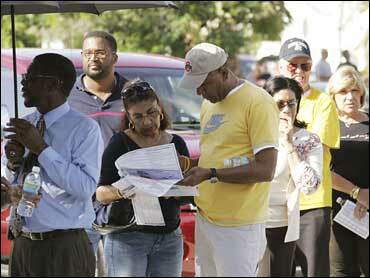 In the south, several voter identification machines in Broward County weren't working, causing delays. Jim Stancarone, an 86-year-old heavy truck equipment salesman, had been waiting 45 minutes at a Pompano Beach library and expected to be there two more hours. He said he usually votes early, "thinking that it'll be faster." He planned to cast a ballot for Republican John McCain, whom he called "the lesser of two evils." Elections officials said they had expected a big turnout and were happy that it was materializing. The Florida Panhandle had a record 3,040 voters, far bigger than any turnout in the past, said David Stafford, Supervisor of Elections for Escambia County. "Lines are a sign of a healthy democracy, and certainly our democracy is healthy today," said Secretary of State Kurt Browning. He urged voters to be patient. But Florida Congressman Kendrick Meek protested what he called "excessive waits" at polling stations and said he was considering filing a lawsuit to have additional voting machines put in place to accommodate the brisk turnout. "No voter should feel discouraged about exercising their right to vote," Meek said in a statement. The Sunshine State is again key this election season, with a prize of 27 electoral votes - 10 percent of the 270 needed to cinch the election. President Bush won here in 2004, but McCain and Democrat Barack Obama are fighting for it this year. Obama's swing was timed to coincide with Monday's opening of early votinge. On the Republican side, Meghan McCain, the candidate's daughter, was meeting with voters in central Florida, and her father planned to visit later in the week. His campaign acknowledged it expected more Democrats than Republicans to vote early, but says Republicans have requested 295,000 absentee ballots statewide compared with 199,000 Democrats. "I truly believe that this is by far the most important election I've witnessed in my lifetime," motivational speaker Alexandra Oliva, 38, said outside the Miami-Dade Elections Department. She voted for Obama because she's concerned about the composition of the Supreme Court, the money being spent on the war in Iraq, and the degradation of America's reputation overseas. Coral Gables retiree Georgina Esteva said she was "very anxious" to cast her vote this year. "I believe Obama is a radical leftist and I am totally against all his views," said Esteva, 72, a Cuban-American who voted for Republican John McCain. "I had to leave my country because of a radical leftist and I don't want to leave this country." About 150 waited in line outside the Palm Beach County Supervisor of Elections office, many wearing Obama stickers, T-shirts and hats. Dee Keener, 70, a retired secretary, said she voted for Obama - even though she is a registered Republican. "Obama's got the inspiration, the intelligence, the will to stay above all the dirty politics. It's just the man. I don't know how to explain it ... I'm shaking just talking about Obama," said Keener, who added she hasn't voted for a Democrat since 1992. "He just has all the right answers as far as I'm concerned." Voters waited up to 45 minutes to cast ballots at the Escambia County courthouse in downtown Pensacola after polls opened at 8:30 a.m. and the line grew longer throughout the morning. For Dennis Collins, 58, and Curtis Munro, 59, the chance to be among the first Floridians to vote for Barack Obama was worth the wait. Both are Navy veterans but said McCain's military service wasn't enough to sway them. "John McCain has done a lot for this country," said Munro, who served on a minesweeping ship off the coast of Vietnam during the war. "But I've been listening to the campaign rhetoric and paying a lot of attention. I think Obama is the right person not only for the United States but for the world." After the voting fiasco with butterfly ballots in Florida eight years ago, several people said they were more confident about the optical scan voting machines being used this time. "I have no fear of it happening again. Everybody is watching," said Archie Gallon, 60, an instructor at Edward Waters College who voted for Obama at the Duval County Supervisor of Elections Office in downtown Jacksonville. At a restaurant in Sarasota, Gov. Charlie Crist spoke to a small crowd about the importance of voting, especially because the presidential contest is expected to be very close. Later, the governor proved he meant it when he approached two diners wearing Obama T-shirts at a Melbourne restaurant. He shook hands with them and asked: "Are you ready to vote? Two weeks from tomorrow, good luck."